We couldn't detect if mod_rewrite was installed. Known cannot process page URLs without it. Proceed with caution." Basically, when on a clean install on a shared host on Dreamhost, at the requirements screen of the warmup, you are told that Known wasn't able to detect the presence of mod_rewrite, and that things might get funny. You can usually fix this by setting AllowOverride All in your Apache configuration. I can put in my details once again, and hit "Onwards!" and I end up on the same page, with the same yellow highlight in the top. According to Dreamhost, mod_rewrite is enabled on all their hosts, and sure enough, if I build my config file manually, everything works fine, including all the rewrite rules in the .htaccess file. This is happening on PHP version 7.0.32. Any warnings or errors in your admin/diagnostics page? "Your site doesn't seem to be loaded over HTTPS. We strongly recommend using HTTPS to make your site secure and protect your privacy." Bonus points - are you able to illustrate the issue with a unit test? If so, submit it as a pull request! Have you tried modifying your AllowOverride settings as suggested? @mapkyca I forgot to specify that on the shared hosting environment on Dreamhost, it's not possible to edit your apache2.conf file, so that's not an option. In order for you to do so, you need to get a DreamCompute instance, or pay for a dedicated server. I don't believe it's possible to change the AllowOverride directive anywhere else but in the apache2.conf file. I wonder whether rewrite is installed, but not necessarily enabled for your host. directive int he .htaccess file, the site throws a 500 error. Both result in HTTP 500 errors. I suspect Dreamhost has done something to stop you from doing that. Either way, it seems irrelevant since mod_rewrite seems to be working, as the vanilla .htaccess file works, including any new directives I've added to it, for example to always redirect http to https requests. @voss DreamHost probably have that capability locked down. Do you get error logs with your DreamHost account? Are you able to see what shows up there when you get those 500 errors? htaccess: <Directory not allowed here. 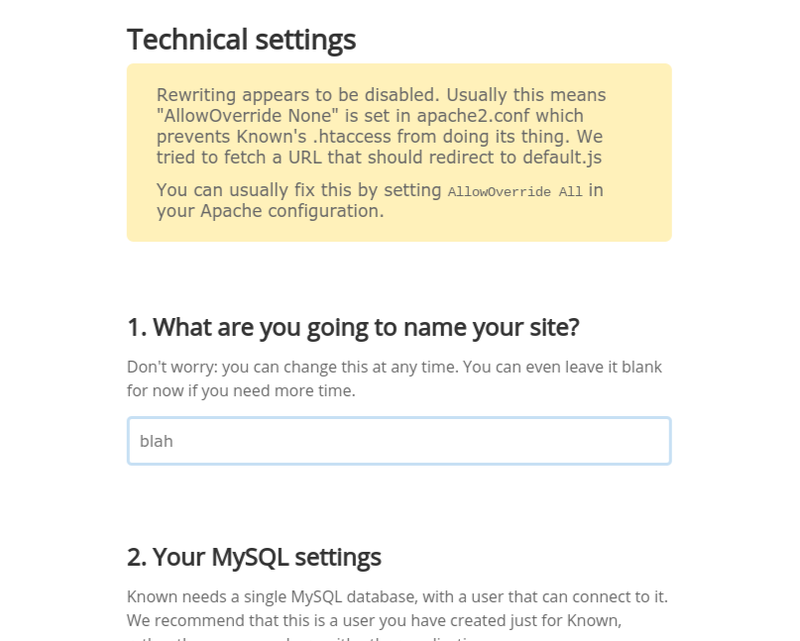 So, as @mapkyca says, and as I mentioned earlier, you can not change AllowOverride in .htaccess. You can only set it in the apache2.conf file. On Dreamhost, you can not change your apache2.conf if you are on shared hosting (which I am). So, to get back to the issue, either Dreamhost has a non-standard setup, where they are able to hide the fact that mod_rewrite is installed and enabled, or the test being done by Known in the warmup section, to test whether mod_rewrite is installed and enabled, is missing something. @benwerd you're correct. Dreamhost defaults to a FastCGI implementation of PHP 7.0 at the moment. I have mine running fine there. Unfortunately that means that apache_get_modules() will not work correctly - nor is $_SERVER['HTTP_MOD_REWRITE'] set (which I think is just more of a convention). I've had no problems running Known on Dreamhost but I just did the config by hand. The installer shouldn't be checking for apache_get_modules on nginx, so I don't think that's the issue. The error shown above is less likely to be a false alarm, since it is trying to access the canary rewrite. Might be worth seeing if you can access that directly. Anecdotally, this appears to be a relatively new thing. Apparently the package on withknown.com does install, but newer packages don't. I guess this means I broke something when I rewrote the installer, although I can't for the life of me see what, or have any idea why it should only crop up on dreamhost. @mapkyca if you need access to Dreamhost to test things out, I'll happily set up a user on my account for you, with ssh access. Just let me know. That'd be quite helpful, actually. You can email me on marcus@marcus-povey.co.uk, my pgp key should be on the standard key servers or my website. I believe the function_exists call is returning false, so the rest of that if-clause isn't executed, and the function (with no explicit return) returns null. Can't double check that is correct right now, I'll need to do so later today, but I think that's what's going on. Remove check for apache_get_version() in rewrite canary. I am not sure why this was here, but it was causing the canary to skip and return null on nginx or similar, where rewrite was possible, but install would still fail. Probably a cut and paste error on my part. I've added you on Keybase. Are you ok with using that for exchanging the info? with the same error discribed above. CLIinstall worked but the wrong .htaccess was distributed! Then I've copyed manualy .httaccess-2.4.dist and renamed it. Also changed all left .htaccess files inside into "Require all denied". The Apache known site-conf has "<Directory /var/www/known/*> AllowOverride All" inside. It seems like the Apache version info wasn't adequate for the Installer and the CLInstaller. Now it stucks at https://blog.mydomain.tld/begin/ with "The requested URL /begin/ was not found on this server." Maybe an bestpractice example apache2.4 site-conf could be provided in the documentation for better understanding of the requierements.